1979: Natural World Heritage Site, inscribed under Natural Criteria vii, ix and x. 1994+: Listed as a World Heritage site in Danger because of civil conflict, invasion and degradation. Although it should provide development opportunities, renewed oil interest in the Democratic Republic of the Congo (DRC) represents a real threat to stability in a still vulnerable post-conflict country. Exploration has begun, but oil prospecting is nurturing old resentments among local communities and contributing to border tensions with neighbouring countries. If oil reserves are confirmed in the east, this would exacerbate deep-rooted conflict dynamics in the Kivus. An upsurge in fighting since the start of 2012, including the emergence of a new rebellion in North Kivu and the resumption of armed groups’ territorial expansion, has further complicated stability in the east, which is the new focus for oil exploration. Stakeholder-related risks in the extractive sector have risen rapidly over the last two decades. Time and again, companies have experienced how negative environmental impacts – such as a spill from a tailings dam – can generate significant negative social impacts as well, for example on local community health and livelihoods. Local communities’ reactions to these impacts can quickly escalate from complaints to protests and road blockades, raising the risks of the company or its security providers using heavyhanded tactics that can lead to even more serious impacts, such as injury or even deaths. Nature underpins economic growth, human development, and well-being. It is instrumental in building today’s economic system and represents the core foundation in the transition to a green economy. In turn, the transition to a green economy will strengthen the foundations of nature by reducing the pressures of economic activities on biodiversity and ecosystems. TEEB is hosted by the United Nations Environment Programme and supported by the following donors. Toward Africa’s green future (English): From the world’s highest mountain ranges to the lowland plains, and from the great oceans and coastal wetlands to agricultural landscapes, nations and communities rely on the bounty and services of natural ecosystems. Biological resources and the goods and ecosystem services they provide underpin every aspect of human life and livelihoods, from food and water security to general well-being and spiritual fulfillment. This report reviews the World Bank support to biodiversity conservation in Sub-Saharan Africa over the past decade (2003-2012), and presents key lessons and directions for the Bank’s future biodiversity-related investments. The Africa region is presently undergoing a fundamental transformation. With a firm focus on biodiversity as a component of inclusive green growth, the World Bank is well positioned to continue and strengthen its role as a leading supporter of African countries’ conservation efforts. Africa may be showing impressive headline growth, but too many of our people remain stuck in poverty. This year’s Africa Progress Report finds that if we want to accelerate Africa’s transformation, then we have to significantly boost our agriculture and fisheries, which together provide livelihoods for roughly two-thirds of all Africans. 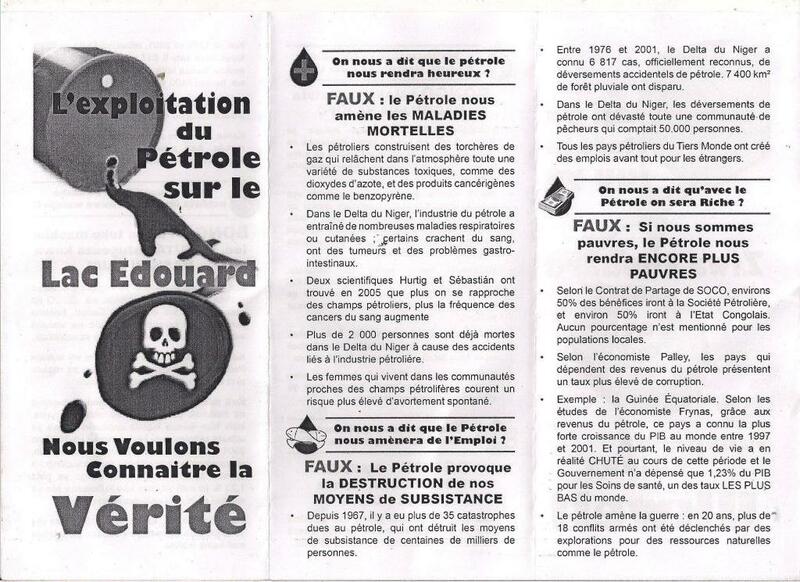 Courrier du Ministre de l’ECNT au Centre du Patrimoine Mondial (UNESCO)Face aux nombreuses inquiétudes que suscitent les recherches pétrolières dans le Parc national des Virunga, un site du patrimoine mondial en RD Congo, le Ministre José Endundo expose dans un courrier adressé à l’UNESCO les mesures prises afin d’aider les décideurs congolais à effectuer le meilleur choix pour le futur des populations du Nord Kivu. This work (In French) hinges on the oil discovery in the Albertine rift zone : Challenges, issues and economic-environmental perspectives. It is conceived within the framework of serving as a proposition of the decision taking of the government as well as other deciders interested by the presence of oil in the East of the DRC. The present scientific contribution is a product of funds coming from the members of Forest and Environmental Friends for Research and Development, in short FEFRED Relief Wildlife. It is a NGO of Congolese environmental civil society for the management of the natural resources which extend over in the central Albertin (vast ecosystem of Virunga).